The terms, self-tracking, lifelogging, quantified self, and personal data, are in most cases synonymous. They generally refer to the same thing: the activity of recording something about a person’s life. Personally, I prefer the term “self-tracking” over the others since it feels the most expansive and most self-explanatory. In this post, I use these terms interchangeably. I define “self-tracking” as the activity of measuring or documenting something about your self. This definition intentionally excludes anything about what motivates someone to track. The reality is that different people and different types of tracking have different objectives. As we will see in this post, most self-tracking is done to gain meaning or to make improvements, but seems to also have a significant connection with the conscious engagement and understand of technology in human lives today. Besides the physical, there are also hundreds of apps to track our psychological side too. You can find dozens of apps to record mood, emotions, stress, energy level, and more. Self-tracking isn’t limited to health metrics either. You can find ways for tracking your location, movements, driving, travel, etc. There is a wealth of apps to quantify your time, like computer and mobile usage, productivity, and project time. In order to help organize and promote the best tracking, for the past couple years, I’ve helped maintain the Awesome List on Self-Tracking and Quantified Self. Awesome lists are basically curated lists of great resources on a certain topic, and they are a great place to start when you want to learn anything new or find new things to work on from topics ranging from technology and programming to even health and video games. 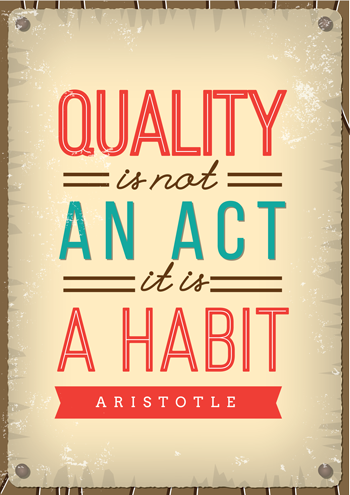 For QS, we’ve provided the best starting place for anyone interested in getting started. While there might be, as sociologist Deborah Lupton estimates, a hundred thousand or more tracking apps available today, we categorize quantified self services into two broad divisions: apps and wearables. Wearable are targeted things you put on your body to track specific parameters and includes activity trackers, smart watches, smart textiles and more. Smart phones are mini computers we carry around and provide a lot of opportunity for tracking. Aggregators & Dashboards: These are sites and apps that pull together data from various tracking sources into a unified view and often provide visualizations and correlations. Automation: These are tools that typically use events from one tracking service to trigger an action or reaction into another service. For example, when I complete a run in Strava, I can post my run log into google sheets or into a chat program like Telegram. A full breakdown of these categories and the various examples of tracking goes beyond this post, but I encourage you to read and explore the various links at our quantified self awesome list at https://github.com/markwk/awesome-quantified-self. In general, if you are just getting started with personal tracking, I recommend picking one category and a single app initially. I’ll admit that my reasons for tracking might not be why you or someone else tracks. My motivations might not convince non-trackers to start tracking either. But before I share why I track and conclude with a few reasons to try and convince why you should track your life (at least in some small yet consistent ways), let’s examine why people track. In a 2010 TED talk on Quantified Self, Gary Wolf explained that when him and Kevin Kelly, another writer at Wired Magazine, held their first Quantified Self meetup in 2007 they were not really sure what they were doing. They weren’t particularly interested in the growth of social media on sites like Twitter and Facebook. They were technologists, so instead they decided to setup an experimental gathering to see how people were incorporating technologies into their lives and what changes in society this adaptation was causing. 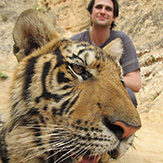 The late comer, turned out to be a graduate student in Human Computer Interaction, who had been tracking detailed data on how he was spending his time during the year he spent writing his dissertation. He walked up to the front of the room, opened up this notebook computer and showed a graph that represented data he collected. Wolf and Kelly were stunned. This was the perfect beginning presentation for Quantified Self. They had guessed that this kind of application of technology was going on, and by accident, they had found it. The personal story of this time tracking project was exactly the kind of thing they were hoping to find. This first talk become the inspiration for a core element of QS meetups: the show and tell. Basically participants share something they tracked, how they tracked and what they learned. Regarding the motivation to start QS, Wolf explained that it wasn’t to launch a movement but to simply explore people and technology. Since their first meetup, QS has grown to cities all around the world, and as we saw in the previous section, dozens of apps and wearables have also appeared to help track our bodies and lives in general. While the specific terms may have lost their popularity, the ubiquity of tracking apps shows that the usage of self-tracking remains just as popular today. In the academic realm, there are over 800,000 academic articles, according to Google Scholar, that reference “quantified self” as well as multiple books and conference dedicated to the topic too. There are a lot of people tracking and quite a few people also writing and reflecting on self-tracking. So what do we know about why are people tracking their lives? In a short piece “10 Reasons Why People Self-Track,”, Eric Jain, tech entrepreneur and creator of Zenobase, an aggregation and data analysis tool of self-tracking data, provides the following reasons for why people track: Curiosity, DIY, Education, Fashion, Fun, Hacking, Motivation, Necessity, Skepticism, and Social. 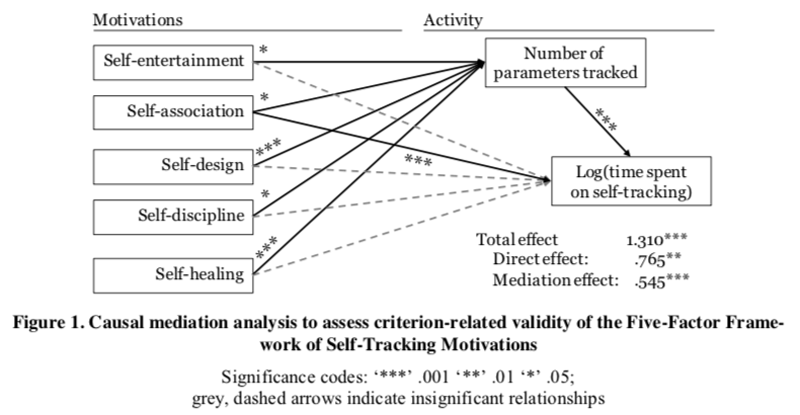 If we look at the academic research, there are two papers that seem to provide the best starting point for understanding motivation of self-trackers: Butterfield’s “Ethnographic Assessment of Quantified Self Meetup Groups” (2012), and Gimpel’s paper, “Quantifying the Quantified Self: A Study on the Motivations of Patients to Track Their Own Health” (2013). Let’s look at these two papers one by one to understand some of what motivates someone to track. While perhaps not the most rigorous of studies and more focused on organizers rather than trackers, Butterfield’s paper, which is available on the QS blog, provides an interesting and early portrait into the founders and organizers of QS meetups. As he states it, Butterfield’s “general goal was to understand the following questions: Why do different organizers start groups? What are the challenges and barriers organizers have been encountering? What are the points of innovation are occurring in the groups?” He then goes through multiple stages of interviews with organizers in order to understand how they put together events and what works best for them. self-tracking, is a set of practices that members of QS undertake. 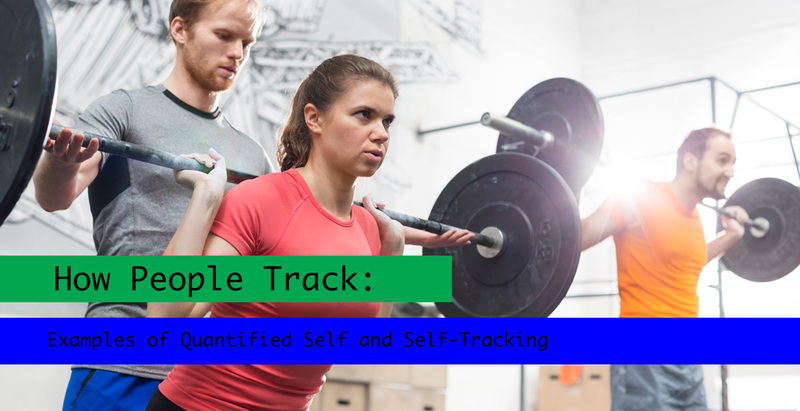 Self-tracking can take many forms, but generally is any deliberate, methodical project focused on some aspect of a person or the world they live in, in order to generate data that can potentially be used for self-improvement. The name Quantified Self came about in an effort to describe this new frame. “Quantified” is the technology piece. Quantified in this sense means “the language of machines,” and refers to both the processes of the machines and the “language” machines use to convey information to users. This information can be numbers, raw data, or representations of data, like graphs and charts. “Self” refers to the person, and whatever aspect of the self is under examination. What we find throughout the piece is examination of a particular form of a “techno-culture.” For Butterfield, “the most important insight is that QS is not a monolithic community where everyone involved shares the same ideas about, and interests in, self-tracking,” and in fact, there are tensions in the group, like around whether what some trackers are doing is science or not and the value of quantitative vs quantitative data. “technological involvement,” i.e. how much does the project rely on technology, devices, laboratory tests and sensors or can it be done with simple paper and pencil? 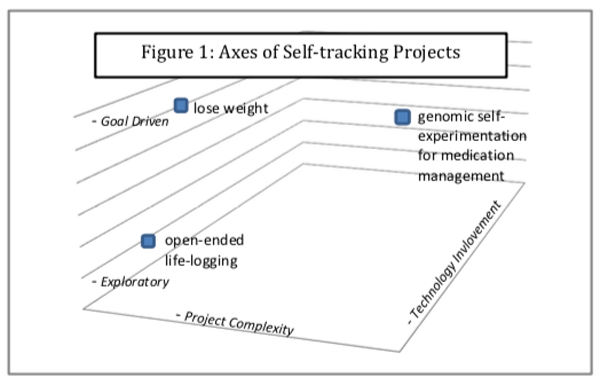 “level of complexity in the design of the self-tracking project,” i.e. these projects might be called “self-experiments” since they rely on a more rigor or scientific method of collecting data, testing hypotheses, and exploring correlations. “goal driven or exploratory,” i.e. is the project driven by a life change or self-improvement? Or it mostly about simply exploring and more general understanding? In summary, the majority of Butterfield’s paper explores the mechanics of the actual meetups and some of the challenges organizers face, specifically like finding a venue and getting attendees. He even provides useful recommendations to help existing and future organizers. What’s interesting in understanding what motivates a self-tracker is this non-domain specific conceptualization of self-tracking projects. Instead of saying it’s a health project or productivity project, we can view trackers and their efforts according to how much technology is involved, how complex the project is, and how much it is driven by goals or exploration. At the start of their 2013 paper, researchers Henner Gimpel, Marcia Nißen, and Roland Görlitz note, “Duggan (2013) estimates that already 69% of U.S. adults track health indicators for themselves or loved ones and one in five thereof uses technology to do so.” Compared to Butterfield’s work, which focused more on the community, their paper take a much more expansive and rigorous approach to understanding why individual track their lives. Age ranges from 14 to 76 years with mean 34 and median 30 years. 71% of respondents are between 20 and 40 years old. 58% are male, 37% female (5% did not disclose their gender); 41% are employed, 33% students, 17% self-employed, 9% other; 53% are from Europe, 39% from North America, 8% other. Following the initial surveys, they then used a statistical method called Principal Component Analysis (PCA), which is a way to convert a set of observations and possibly correlated variables into a set of uncorrelated variables called the principal components. Essentially they gather a wide range of stated motivations and then converted into a unique set. Ultimately this lead to five englobing motivations. Of the five motivations, individuals showed the highest adherence to self-healing and self-design. The researchers noted anecdotally that those motived by self-healing were often had “a certain rebellion against the healthcare system” and looking for alternative therapies too. 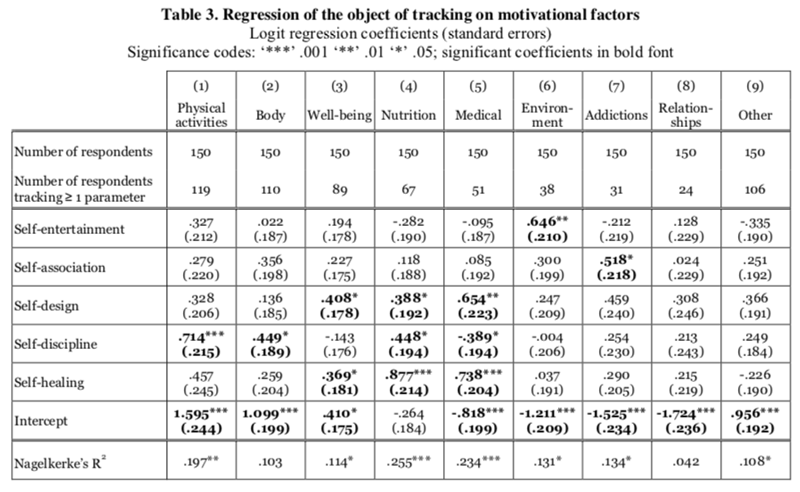 Accordingly there is a relation between the number of motivations people subscribe to and how much they track: “Data shows that more motivation on a single factor leads to increased tracking activity and, in addition, motivation from different factors is cumulative.” Basically when you have multiple motivations and stronger motivation of a specific factor, the result is an increase in the number of areas you track and amount of time you spend tracking. Taking a step back, what does this mean for an individual tracker or for someone building a tracking app or tool? For an individual tracker, you can start by asking yourself which of these five factors motivates you. If you find you have a vague interest in tracking but aren’t very disciplined than most likely you have little adherence to the key motivations. Similarly, if you track a lot of factors, like I do, there is a good chance you multiple motivations and interests that keep you involved and trying new experiments. A system or service engineer trying to motivate tracking of well-being (model 3), nutrition (model 4) or medical aspects of daily live (model 5) will be most effective when appealing to a combination of Self- design and Self-healing. In summary, people track their lives in various ways and for various reasons, but as this research shows various motivations can be reduced to a five-factor framework with the two most popular reasons being self-healing and self-design. With well-over 160,000 tracking apps for smart phones and dozens of wearables, there are a lot of ways to track a life. Examples of quantified self and self-tracking spans a number of categories from Activity & Fitness, Health, Heart, Diet, Sleep, Mind & Cognition and Mood to Goals, Habits, Tally, Time. You can track your media consumption like TV, music listening and even podcast listening and there is a whole area for general data collection or lifelogging too. In short, it’s easier and more accessible than ever to track ourself. But with all of these ways and tools to track, it still begs the question: What motivates someone to track their life? Why self-track? In this post, we look at a research papers that probed this question. At the origin of the Quantified Self movement we find a number individuals like Gary Wolf who were motivated by idea of using tracking to understand their engagement with technology as well as to try use technology to mediate our understanding of human behavior. We are a technological society, and we can use technology to help us better understand ourselves and our relationship with technology. Personally I find a lot of my engineering friends who track are motivated in some way by their general interest in playing and engaging with technology. By looking at two research papers about Quantified Self from the perspective of organizers and trackers in general, we were able to come up with two frameworks for conceptualizing aspects of the QS movement. Butterfield’s research provide us with three axes to place self-tracking projects: technological involvement, level of complexity, and goal driven vs. exploratory. At present, Gimpel’s Five-Factor Framework provides the best way to conceptualize what motivates self-trackers, namely: self-healing, self-discipline, self-design, self-association, and self-entertainment. Basically, is the tracker motivated by getting healthier? is it fun? is it because they are part of a group? Do they track to enforce a regime or process? Or is it part of a broader effort to control their lives? Personally I find Gimpel’s framework encapsulates the major aspects of what motivates me to self-tracking. Originally, I started tracking my time and productivity, because I was looking to gain more understanding of how I worked best. This touched on aspects of self-design. Over the last few years I become much more motivated by my health and tracking my blood biomarkers and fitness routine become a good way to pursue self-healing and more extended way of enacting self-discipline too. While I like that there is a community and term like QS, it’s not a particularly strong adherence for me. I do find there is an entertainment value for me though. I find it interesting that Gimpel uses of “self” in each of these terms. Admittedly, there is a thread of narcissism in the QS and quantified self movement. But personally I find that one aspect that motivates me in self-tracking is possibly of extending my personal data into broader citizen science. Specifically I think that as we get more and better data from a wider range of people, we can start to model that data to understand trends in health, happiness and general improvement. Basically self-tracking can lead to a better understand what it means to be human. This somewhat non-self aspect motivates me to self-track and build thing in the tracking space too. Why do you track? What motivates you to track a life? A. D. Butterfield. “Ethnographic Assessment of Quantified Self Meetup Groups.” (2012): Accessed May 7, 2018, 2018. http://quantifiedself.com/wp-content/uploads/2012/05/Adam-Project-Report-5-17.pdf. Wolf, Gary. “The Data-Driven Life.” The New York Times 28 (2010): 2010.